Also is missing are two long and short vocal versions of "Hold You Still!" used in the PSX/Saturn ports. 5.04 Let's run through! (Stage 1 "city") is stage 3's theme. 5.06 Snowy road (Stage 3 "snowy mountain") is boss theme #1. 5.09 Secret place (Stage 6 "final") is boss theme #2. 5.10 The scene of a hard battle (Boss 1) is stage 1's theme. 5.11 Furiously (Boss 2) is stage 6's theme. 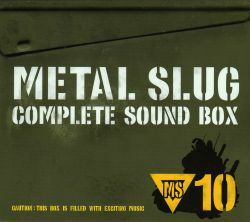 Included is the complete compositions from all 7 Metal Slug titles, and previously unpublished music from the series that never made it into the games. The set also features brand new designs from the series illustrator TONKO and a very special 32 page booklet with many composer comments plus unpublished information! There is also an exclusive arranged track ("weapons free arrange" (Metal Slug Arrange Version)) by Basiscape's Mitsuhiro Kaneda.